Let's say you work in the oil fields in Texas, or the salt mines in New York and you need a phone that you can depend on to continue working no matter how extreme the environment is. You don't need a smartphone, just something basic that can summon help if necessary. Well, Verizon has now launched the Sonim XP5. This device meets military spec 810G, which means that the unit can handle extreme high and low temperatures, drops and shocks. With an IP69 certification rating, the Sonim XP5 can be submerged in water to a depth of up to 6.5 feet for as long as 30-minutes, and emerge unscathed. 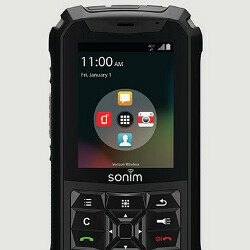 The Sonim XP5 features a 2.4-inch display, with a resolution of 240 x 320. Powering the handset is the Snapdragon 400 chipset with a dual-core 1.2GHz CPU and the Adreno 306 GPU. 1GB of RAM is inside along with 4GB of native storage. Dual front-facing speakers allow you to hear conversations easily even in an area where loud machinery is running. There is a 5MP camera on board, and you can talk to a single person or an entire group with a single tap of the PTT button. The phone comes with a three-year warranty that covers accidental damage. To activate the warranty, the phone must be registered within 30-days of purchase. You can buy the Sonim XP5 for $14 a month over 24 months, or fork over the entire retail price of $336. Also launching today at Verizon is the Global Modem USB730L. Priced at $80 with a signed two-year contract, or $249.99 retail, this device gives you 4G LTE connectivity in the states, and secure access to the internet in over 200 countries. The modem is compatible with both iOS and Android allowing you to plug and play. If interested in either device, click on the appropriate sourcelink. except for tethering why would you need 4glte on a dumb phone with a small screen? Because verizon is slowly trying to get rid of its CDMA network. Because with 3G disappearing in the near future and Verizon making/upgrading towers to be 4G LTE only, LTE will be give your basic or premium phones the best coverage it can get. LTE connectivity enables HD Voice. HD Voice is carried over the LTE Data signal to achieve crystal clear calls that make it sound like the person is standing in the same room as you. Wallpaper reminds me of when Jelly Bean came out. I remember this background on my Galaxy Nexus.